My foster father, Duane Olson, took me hunting when I was in high school. He liked to “jump-shoot” ducks. He knew places where there were likely to be ducks. We would then stalk the ducks at those locations. Once we got close, we would “jump” the ducks into the air. We’d get a couple birds most every time.Often my genealogical efforts use the same method. First, it helps to know where the information might be. Then, I stalk the places and “bag” my information. I don’t have many trees that have Maine roots, but I thought I’d take a quick and see if the Maine Register would shed light onto the families that I do have. I pulled up the 1912 edition to see what I could find. 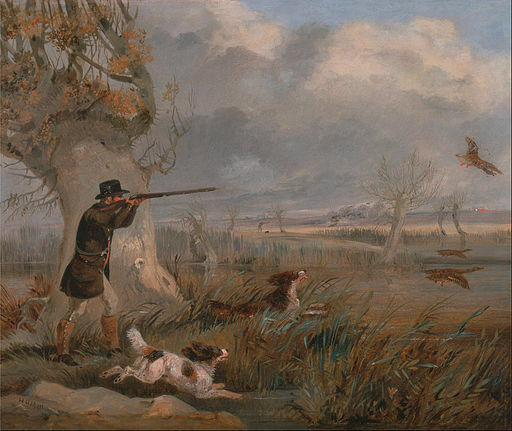 Sure enough – there were over twenty entries on a “Bickford” search and nearly as many for “Whitten.” Briefly looking at the search results, I saw noticed several known ancestors in the findings. 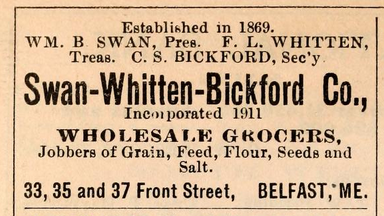 I also found an interesting company, the Swan-Whitten-Bickford Co., wholesale grocers in Belfast[i]. I would speculate there must be some kind of connection between that company and the Whitten-Bickford marriage twenty-five years later. If you use the Maine Register, great! If you aren’t using it yet, I highly recommend adding it to your list of important sources to “jump shoot” when you are hunting for information on your Maine ancestors. I’ll bet other states have them too. If you know of a similar book for another state, please let me know by posting a comment below. Previous Previous post: Donna – A “Cabaret Girl” in Panama.